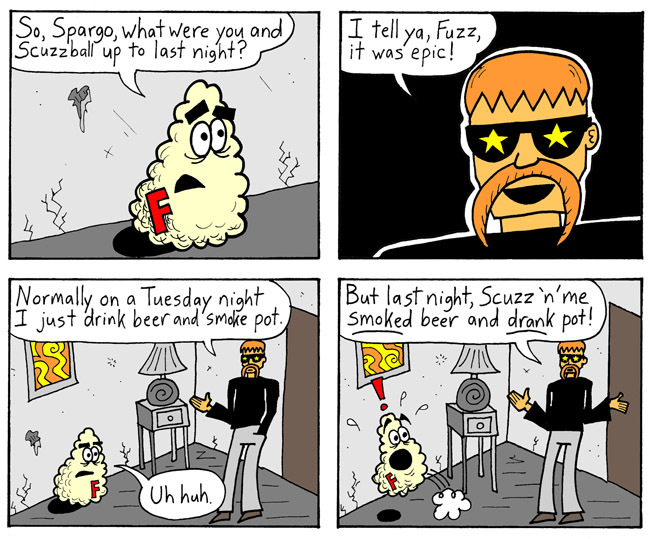 Back in 1999, a man named Steve Johnson asked me to write and draw a weekly Fuzzball & Scuzzball comic strip. I was initially hesitant. Then one day, out of nowhere, I thought of the smoked-beer-and-drank-pot joke, and it made me laugh. I agreed to do the comic strip. The original version that I drew in 2000 was part of a storyline called "The Visitor" that is no longer in the archive, because I don't really like it. This joke still makes me laugh, though, so I thought I would recycle it with new character Spargo Detritus. Which is a lot of explanation for a fairly dumb joke. Next week: Something completely different!